The UBC Himalaya Program recently attended the BC Buddhist Festival and had an inspiring time discussing Himalaya-related topics with members of BC’s Buddhist communities, along with festival-goers curious about the region and its diverse heritage. 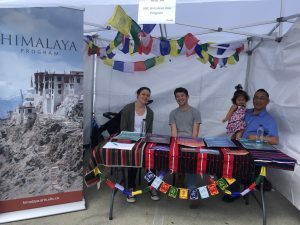 At the festival, which was held Sunday, June 10th, members of the Himalaya Program Steering Committee and instructors of our Nepali and Tibetan language courses were on hand to explain the goals of the program and engage with visitors to our tavle. We are grateful to the BC Buddhist Festival organizers for the invitation, and hope to continue learning from them and our other community partners in the future. Pictured, left to right: Vicki Sear, Graduate Student Coordinator, Joshua Medicoff, Program Assistant, and Binod Shrestha, Nepali Language Instructor.